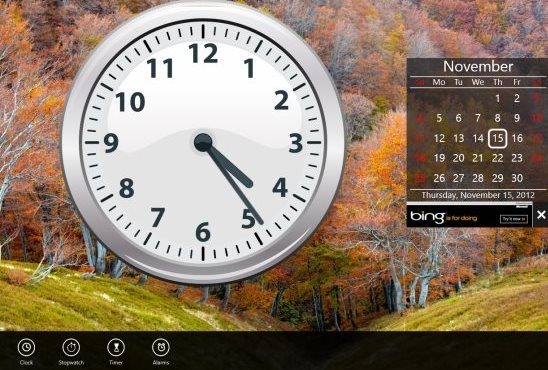 Here are 4 free Windows 8 alarm clock apps designed for those who want to perform each of their tasks on time. 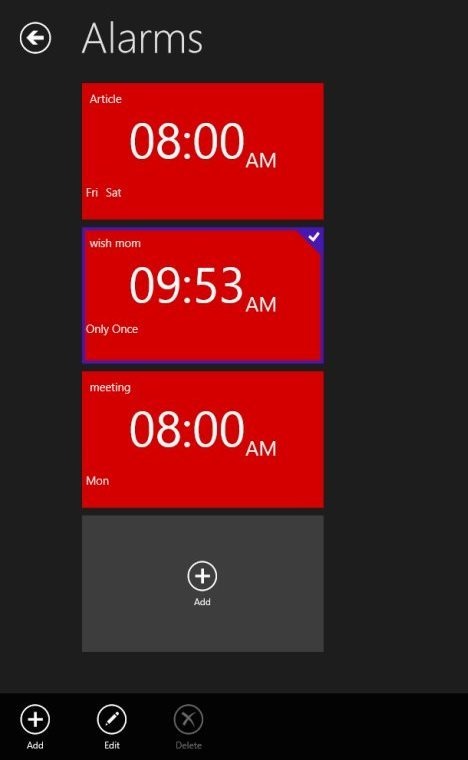 All these alarm clock apps for Windows 8 let you remember everything you need to carry out. Right from getting up early for important board meeting to getting up for wishing wife’s birthday at 12 night, just everything. You can easily find all these Windows 8 alarm clock apps in Windows 8 app store. Just open the Search Bar (by pressing Win+Q) and enter the name of the app you want to search. Else, just open the link, given with the description of each app below, in IE10 and click on ‘View in Windows Store’. The most popular Windows 8 alarm clock app, Koalarm, brings you both alarm clock a timer. You can easily set up to 6 different alarms at one time. Yup.. the app allows you to set multiple alarms at once. Also, there are 5 default timers available including 5mins, 10mins, 15mins, 30mins, 60mins along with a ‘Custom’ box where you can create customized timer. Koalarm is available under the ‘Productivity’ section of Windows 8 app store. As you open the app, you will find a large beautiful six boxes for alarms. You need to click on the box to add an alarm into it. Similarly, for rest of the alarm boxes. To switch over to ‘Timer’, just right-click anywhere on the screen ? a horizontal panel at the top of the screen will get opened ? click on ‘Timer’ options among the given two. Read more Koalarm or just open this link in IE10 and click on ‘View in Windows Store’. This will instantly take you to Store, opening the app directly. What I really liked about metroAlarm Windows 8 alarm clock app is its classic alarm sound that plays when an alarm goes off. Initially it plays a beautiful soothing sound, but if you did not wake up with that, it then starts creating the old alarm sound loudly. Another feature that made me towards using this alarm clock app for Windows 8 is its describing function. Yup.. you need to put keywords while setting an alarm. Theses keywords let you remember your work for which you put the alarm. You can set as many alarms as you want, at one time. You need to fill in the details such as keyword, time, repeat alarm, or select a day. Read more about metroAlarm or simply head over to the app store and install it now. 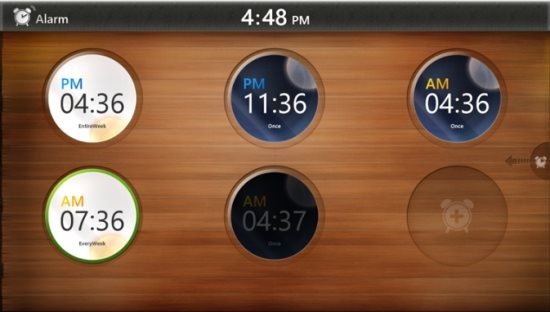 Yet another free alarm clock app for Windows 8, Clock. It brings up an amazing large digital clock with a calendar as a gadget. Apart from a normal clock, you will also find Stopwatch, Timer, and Alarms. This Windows 8 alarm clock app lets you adjust settings according to your requirement. Enable or Disable ‘Show second hand’ and ‘Prevent sleep while clock is active’ option, for example. You can also control on toast notifications, in case you do not want to receive them. Read more about Clock or simply go onto the Windows 8 app store to download Clock in Windows 8 now. Ending my last post with this last and yes the least Windows 8 alarm clock app, Alarm Clock. Although, it’s very beautiful, colorful, you can change the background and put your own picture or any other wallpaper from your local machine, however, the sound it creates while ringing an alarm is very low. If you are in deep sleep, then it’s almost impossible for you to wake up by hearing that very low sound. 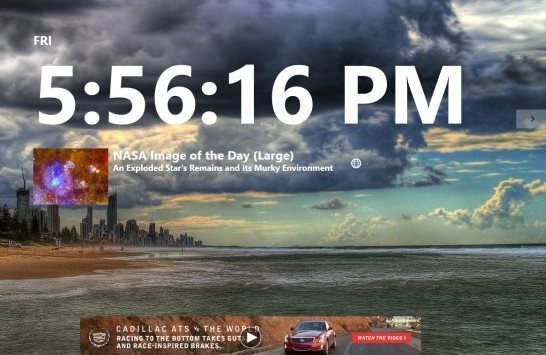 Still if you want, you can use it as a beautiful digital Windows 8 clock. The interesting part about this Windows 8 alarm clock app is that it shows you the News headlines on a selected topic, right on the digital clock screen. You can read more about Alarm Clock or just download it from the Windows 8 app store.